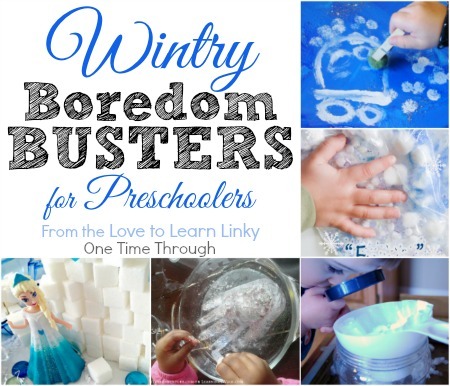 If you’re looking for some fun and Wintry BOREDOM BUSTERS for your preschooler – today is the day to visit! We’ve got “chilly” science, art, and sensory activities that can all be done in the comfort of a warm, cozy kitchen (bonus for those days when it’s too cold to head outdoors – like today in Ontario -18°C/-1°F with a windchill of -30°!). 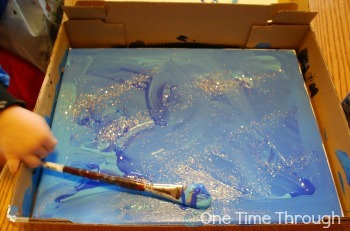 To begin, I squirted some blue paint onto my son’s canvas and gave him the large brush. I suggested to him that he paint a wintry wonderland and this is what he created. Last, I stuck a pom pom onto the end of a clothespeg and let my son dab white paint where he wanted onto the canvas. I’m thinking this would be a great way to make snowy looking trees, fields, snowmen, snowflakes, etc, but instead of making snowy-looking things, he created a white car (figures!). That’s the great thing about leaving art open-ended – kids get to create what THEY want. After our painting was dry, we returned to it with a glue gun and my son added on some white and sparkly pom poms with my help. This painting is now a favourite on our mantelpiece! Sensory Snowman Art from Mini Monets and Mommies. Waffle Snowman Art at Juggling Act Mama. Bring some snow inside and have fun measuring its temperature with a thermometer as it melts, then comparing the temperatures to water from the tap, and then warm bath water. You can even let it melt through a coffee filter and see how clean it is, then measure its pH with homemade Litmus paper. Build Elsa’s Ice Palace from Left Brain Craft Brain. Icy Hand Sensory Activity from Learning 2 Walk. Put some snow into a large bin for your child to play with. Add some scoops, cups, a magnifying glass, and maybe even playdough tools and see what happens! Onetime, my 3 yr old, played with this bin for an entire hour while I got to make some homemade soup for dinner! Just remember to give your child gloves if they want. 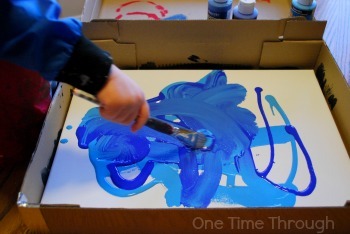 Wintry Learning Sensory Bins from One Time Through. Melting Bathtime Snow Globes from One Time Through. Snow Playdough from One Time Through. 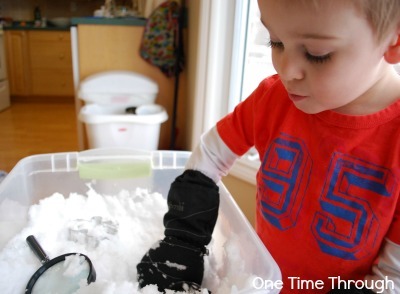 No Mess “Frozen” Sensory Play from A Little Pinch of Perfect. Frozen Winter Sensory Bin from Learning 2 Walk. Frozen Printable Learning Pack from Totschooling. That’s it for this week! Hope you found some fun and “chilly” activities for the kids today. Thanks to all the bloggers who participated in our linky! 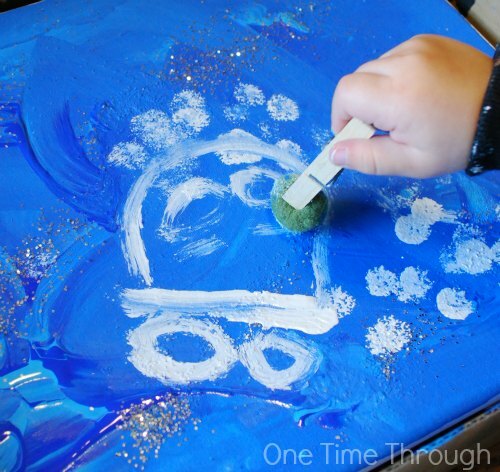 If you’re looking for other kids’ fun and educational Winter activities, be sure to follow our Pinterest board: Follow One Time Through’s board Winter Kids Crafts & Activities on Pinterest. To a cold and fun Winter! Don’t want to miss out on any more of the fun we have here? Sign up for our NEWSLETTER today to receive notifications by e-mail of new posts and exclusive access to my best printables! What a great list Sue! Winter boredom has set in (even in California!). We’ll have to mix up the routine with some of these. Thanks for including our Elsa Ice Palace building activity too. Thanks Anne. I hear you about the boredom – there’s something so depressing about January after all the fun holidays are done – it seems to take a few weeks to key down a bit and get back to a normal routine. I love the snowy ideas. We have got to do the coffee filter snow thing once it snows again. Actually I should do it now with the old dirty snow. My daughter and son both eat any snow they can find and it freaks me out, especially when its old snow. The verbal talks aren’t working so maybe the visual lesson will. Thanks for the great ideas! Definitely try the filter activity then Katie – when we did it, the snow looked perfectly white, but there was all kinds of dusty grey particles on the filter after. Very interesting…hope it helps with your kids! Thanks for dropping by! 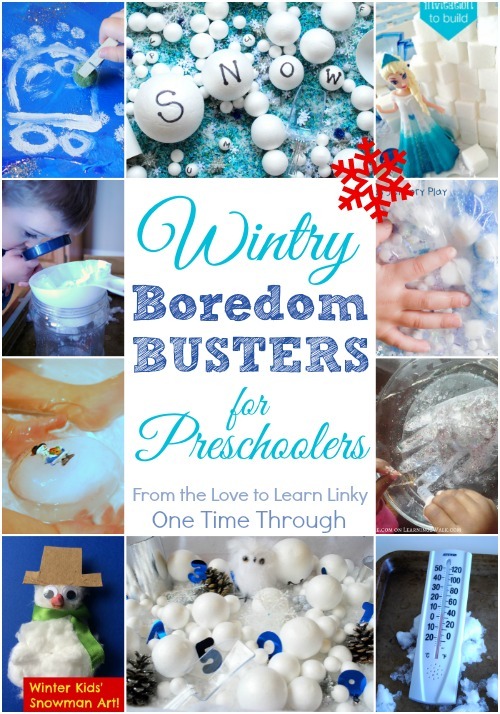 Love all these wintry boredom busters! Thank you for including our waffle snowman while we were at Juggling Act Mama. I was just talking with some friends about coming up with things to do during the winter months! Thanks for the great ideas!